If you have the cat that freaks out whenever you try to travel by plane or by car, you will probably have to come up with a different plan. You can choose to leave your cat with friends, at home, or in a boarding place. Whatever you choose will probably depend largely on your cat and their attitudes and ability to adapt. 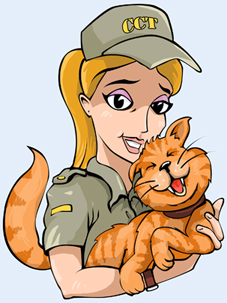 A boarding place will allow you to leave your cat in a place where they will be taken care of. Unfortunately not all pet boarding facilities are a great place to leave your pet, so you will have to do a lot of careful research before just dropping off your cat. A friend of family member might take in your cat so they can take care of all your cat’s needs while you are gone. You can also choose to leave your cat at home if you will only be gone a short time, or have a cat sitter stay at your home with your cat. Don’t ask just anyone, make sure they can be trusted, and make sure to leave them with a list of things such as what food you feed, when you feed, when to clean the litter box, and any emergency numbers as well. For some, this might end up being the best option for their cat. If you cat likes to go on car trips with you, then traveling a long distance by car is going to be a piece of cake. On the other hand if they detest it, it might not be the most enjoyable trip. Either way, you need to make sure that your cat is ready to travel with you. First, you definitely need a cat carrier when you are driving to help keep your cat safe and so you won’t become distracted while driving. You also need to make sure you cat has their collar on with their identification tag on it. If you cat doesn’t like the car, you might want to try getting him used to it in advance by taking your cat out for short trips around the block or down the street. Before you leave on your trip, you need to make sure to pack your cat’s bag as well as your own. You need to make sure that you have their bowls, food, medication, litter box, litter, cat bed, cat toys, and some sort of scratching post so he doesn’t tear up the room of wherever you are going. If you cat absolutely freaks out when you put him in the car, you might need to come up with another plan for your cat while you are away. Some cats enjoy traveling where others do not; it really depends on your cat’s personality. Traveling can either be and easy or difficult task when you have your cat in tow. There are different ways that you can travel and there are also different things that you need to consider with each mode of transportation.